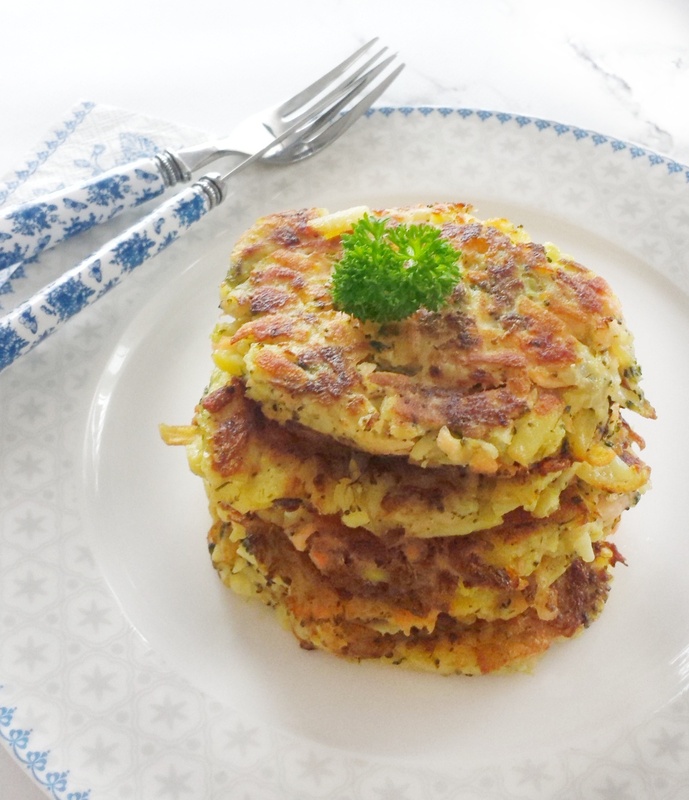 Rösti with Salmon & Vegetable, some may call these fritters. Either way this is a really delicious meal! Suitable for BLW from 7-8 months up (if no egg allergy). This dish, with or without salmon is now Lilbro’s favourite. Every time I served this to him, he would wolf it down within 5 minutes and licks his plate clean! 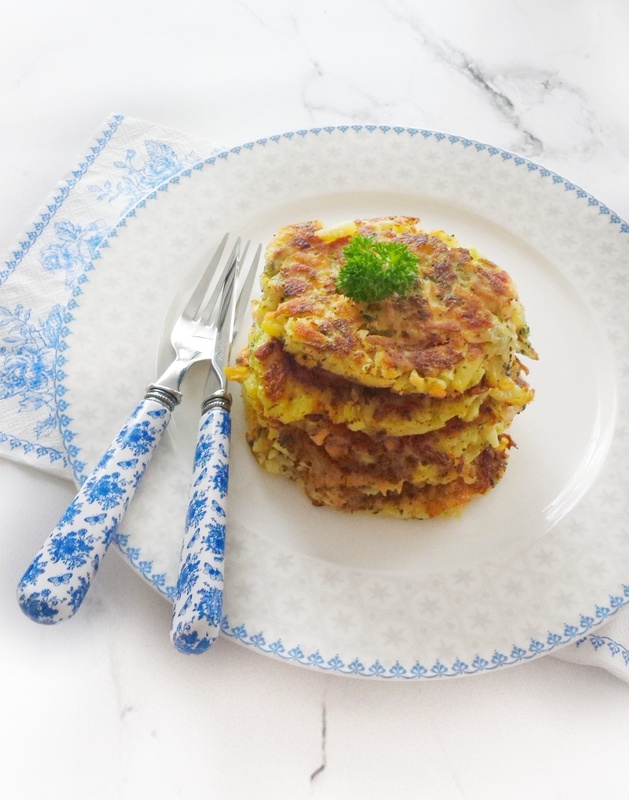 Rösti is typical Swiss dish consisting mainly of potatoes in the style of a fritter. It was originally a breakfast dish, commonly eaten by farmers. Having lived in Zürich for 3.5 years this was one of my favourite Swiss food. The traditional Rösti is just grated potatoes but I have tweaked it to add salmon, carrots and zucchini. My boys don’t eat these vegetables if I serve them separately, hence, I must always hide them somehow. I hope you get to try these as they have become a favourite at home! TIP! – I have use parboiled potatoes as it’s quicker to cook through, but feel free to use raw potatoes.It just takes a bit longer to fry. *Parboild potatoes – Cook the potatoes half the time you would normally cook and keep the skin on. Peel the potatoes and carrots first, then grate them and put in separate bowl, grate the zucchini and move over to the carrot bowl. Place the grated parboiled or raw potatoes in a large and deep bowl. Heat up a large non-stick frying at medium heat with some oil. Add grated carrots and zucchini, saute until they are almost soft. Add salmon, salt, pepper and lemon juice to the pan, keep stiring and break the salmon pieces up until everything is well combined. This shouldn’t take longer than a few minutes. Don’t overcook the salmon. Transfer the salmon mixture over to the potatoes, add the beaten eggs and cornstarch and give it a good mix. Back to the frying pan – scoop the batter with a tablespoon and gently place it in the pan, then flatten it with the spoon and mould it to a round shape. Repeat this process until the pan is filled. Fry for approximately 2-3 minutes or until golden brown then flip over. Looks great! How much salmon? It says “300 great” – I’m assuming grams? Can you use canned salmon?